T his article assumes that you already know how to prepare a countertop for tiling. We will be focusing only on the actual act of tiling. For countertop tiling, and really any tiling job, you’d be wise to invest in a tile cutter. This will make your life much easier and save you loads of time and money in the long run. You’re almost guaranteed to have to cut some tiles in order to make everything fit right. It’s important to note that the edge of a cut tile is going to be both fragile and hard to clean; as such, it’s best to try and plan ahead so that all of your cut tiles are towards the back of the countertop. Always remember to take the grout lines into consideration when cutting tiles. As we mention in some of our previous articles, you should lay the tiles out as you want them to look before you start the installation process. Use plastic spacers to represent grout lines. Avoid having small slivers of cut tiles by widening the grout lines slightly. Mark along the edge of the countertop to allow for edging tiles and a grout joint. It’s usually a good idea to nail a guide strip along the line before you lay out the field tiles along its edge. Lay them all the way to the back of the countertop and use a rule or straightedge to make sure they’re properly aligned. Mix up enough mortar for about 2 or 3 square feet. Allow it to set for the instructed time and then start spreading it on evenly, beginning at a corner of the countertop. Once you have 2-3 feet covered in mortar, you can start laying the tiles onto the countertop, starting from the edge of the spacing strip you attached earlier. Press the tiles firmly to set them, shifting it back and forth very gently so it fits snugly. 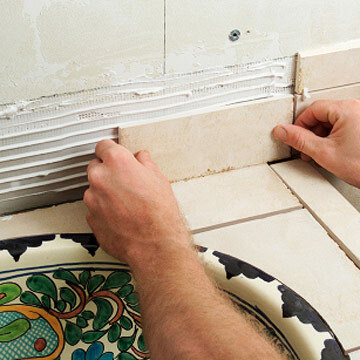 Use plastic spacers to maintain even gaps as you cover the mortar with the tiles. Once the tiles are placed correctly, make your cuts where necessary and remove the plastic spacers. Repeat as needed until everything within the edge spacers is installed. Once the tiles have had time to set, you’re ready to attach the edging pieces. Remove the edging strips and prepare more mortar. The best method for attaching edging pieces is to apply the mortar directly to the back of the tiles instead of the counter. Position the edging so it’s against the full tiles, and then wiggle it slightly as you firmly press it into place. Let the mortar harden overnight before continuing to the final step. Following the manufacturer’s instructions, mix enough grout to fill in the gaps between tiles. It’s always better to have too much than too little, so give yourself some wiggle room. Once your grout is prepared, use a grout float held at a 45-degree angle to the surface of the counter. This will quickly and easily force the grout into the space between the tiles. Use the grout float in the same manner to remove excess grout, substituting for an old sponge for touch-up work. Allow the grout to dry overnight (or as directed by the manufacturer’s instruction) before using your new tiled countertop.